Two weeks ago my daughter finally started nursery. It may only be for 3 hours in the afternoon but it was definitely something she needed and was looking forward to. So I get a bit of time to myself and she gets a bit of time to play with other children. So in the last post I showed what I had made for my niece, well today I’m going to show you the card I made for her brother, my nephew. I decided that instead of using a stamp I would use letter stickers. The paper is from American Crafts Tea Party paper, The border punch is upper crest from Fiskars and I used the stars Cuttlebug embossing folder. On another note, I just wanted to say that I jumped on the bandwagon over a month ago and got a pinterest account so if anyone wants to have look, here is the link to my Pinterest. Previous Post Happy Birthday Sophie. 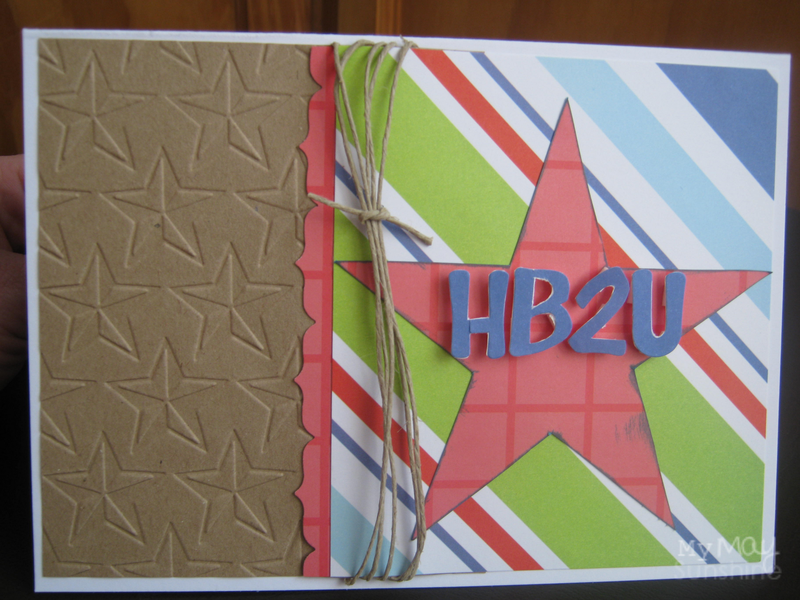 Next Post Happy Cupcake Day Card.